There are so many great family activities scheduled for Thanksgiving weekend in Montauk. 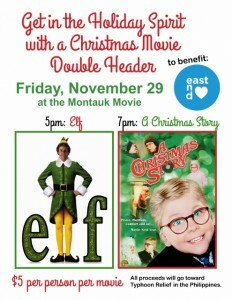 Here’s a few:- EH Town’s *Turkey Trot *on Thursday (around Fort Pond – 10am start, register until 9:30am) – *Christmas movie double-header* on Friday at the Montauk Movie (*Elf*, 5pm – *A Christmas Story*, 7pm). See attached. – the Montauk Chamber’s* Family Fun event at the Yacht Club* on Saturday (1pm to 3pm) – the *Lighting of the Lighthouse*Saturday (festivities start at 4:30). See attached. 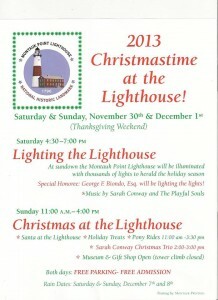 – *Santa and more at the Lighthouse* Sunday (11am to 4pm). We hope to see you around.-Maureen, Montauk Youth Inc.
East Hampton PAL Football/Basketball is holding its annual fundraiser this Friday – November 15 – from 5pm to 8pm at The Stephen Talkhouse. Kathleen Fee and her band Celtic Cross will be playing (you won’t want to miss this – they are amazing!). The cost per ticket is $20 in advance and $25 at the door. They can be purchased through PAL football players and through the parents listed below. The event will also include a silent auction with dozens of prizes including Patio Heaters, Lawn Furniture, Sports Memorabilia, Fine Wine & Cigars, Luxury Watches for Him or Her, Apparel, Fuel Oil, and more. The PAL program supports numerous competitive East End football and basketball teams throughout the year in Suffolk County leagues, and relies on program fees and fundraised monies to cover insurance, equipment, and other costs. Dozens of children in each grade level – ages ages 5 to 14 – from Wainscott, Bridgehampton, Sag Harbor, East Hampton, Montauk, Springs and Amagansett participate. Please come out and support this worthwhile program, and have fun while you’re at it. Don’t miss the PTA’s Halloween Parade on Thursday. Meet at Pizza Village for the 4pm start. Trick or Treat at the Downtown businesses, then head up to Camp Hero. Montauk Youth will be handing out Glow Sticks at the first corner house in Camp Hero – be sure to stop by. The 5th and 6th grades are holding a movie night this Friday, November 2 to raise funds toward their annual Mets trip. The double-header includes Monsters University at 4pm and Iron Man 3 at 6pm. Each movie costs $5 per person – the refreshment counter will be open. Children in 3rd grade and below must be accompanied by an adult. Visit http://montaukschool.org/events/2013-14/Movie_Night_2013.pdf for more details. Last but not least….the PTA is having its annual Fall Fling this Saturday, November 2 at ENE from 6:30 to 10:30. The costume party costs $30 per person and includes a 1/2-hour open bar, dinner buffet, dj, raffles and prizes for the best costume. Funds raised benefit PTA programming throughout the year as well as their annual scholarship fund. Please note that due to the weather, Flag Football and Spirit Squad are CANCELLED today (October 23). 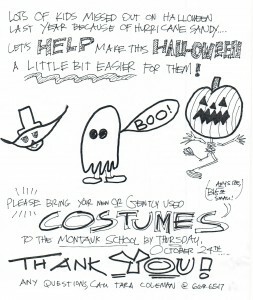 Please contact the Montauk School ASAP with instructions on what your child will do at 3pm. Field Day was AMAZING! Thank you so much for all who volunteered their time and efforts, all who donated food and prizes, all who came out to enjoy the festivities, to CCOM for providing cooking staff and taking on the costs of the bounce houses and band, and to Jack Perna for being such a great sport as this year’s pie throw recipient! It is my favorite event of the year – the feeling of community and the smiles on our kids faces make everyone’s efforts well worth it! I can’t say enough thank yous…thank you, thank you, thank you…. Now on to other Montauk Youth activities…..
*MONTAUK’S SCARECROW DAYS* have started. We have handed out a good number of frames and locations, and are ready to take on more than ever this year. Pick up your frames at CinemaCycle at the Montauk Movie, or call me (668-1540) and we’ll be sure to set you up. We’d love for your scarecrow to go up for this weekend’s Fall Festival activities, but have no fear…this is a Montauk casual event. Put your scarecrow up when you can. Part of the fun is seeing new scarecrows pop up around town each day. Judging will take place at the end of this month. This event is FREE and all are welcome to participate!! *STREET PAINTING AT MONTAUK’S FALL FESTIVAL* this Sunday, October 13 in downtown Montauk. We tried this event out last year on the Sunday of Fall Festival on what we thought would be a limited basis and the participation was amazing. Find our tent on Main Street beginning at 10am, pick up a pack of pastels and a 5′ x 5′ square of concrete assignment, and create away. Again, this is a Montauk casual event – it’s FREE, and what you create is up to you! Be sure to look for your photos on our Facebook group after the event. Thanks again for the continued support of all of our programs and events, and kudos to all of the volunteers who are making them the success that they are! Montauk Youth and CCOM’s annual *Field Day* is *this Sunday, October 6*from noon to 4pm at Third House (Theodore Roosevelt County Park). Open and FREE to all ages, join us for races, obstacle courses, bounce houses, face painting, fire trucks, a pie throw, and so much more. We’ll be selling chili, drinks, hot dogs, soups and treats to keep you nourished and hydrated! And….we’re raffling off a beach cruiser bicycle, an iPad, and CCOM merchandise. Look for raffle sales at the Post Office today and Friday. Please let us know if you can help at Field Day. It’s an all-volunteer event, and we always need help selling raffles, organizing the races, setting up, cleaning up, etc. *Archeology Fest* will be held this *Saturday, October 5* from 10am to 5pm at Second House. The Arch Fest will feature demonstrations of prehistoric and native skills such as early cooking techniques, bow- and arrow-making, flintknapping, friction fire, and so much more. World-known archeologists and historians will give informative talks and answer your questions. Food and beverages will be available. Honora Herlihy is heading up a Bake Sale at Archeology Fest to raise funds for Second House museum restoration. If you can bake, she is accepting large brownies or cookies (no nuts), wrapped individually for sale. Contact her at lobstermann@gmail.com to arrange drop off or pick up. The Scarecrows are coming. * *Montauk Youth and the Montauk Village Association’s* **Scarecrow Days* are almost upon us. Assignments and frames will be available for pickup beginning this Friday at CinemaCycle at the Montauk Movie. We will have them at Field Day as well. We’d love to have the scarecrows up by Fall Festival weekend (October 12 and 13). Contact Maureen with any questions. 668-1540. Don’t forget…..tonight is *Open House at the Montauk School*. This is a reminder that *Montauk Youth Soccer starts tomorrow (Saturday, September 14)* at the Montauk School at 10am. You can sign your child up there if you have not done so already (look for Jackie T. near the Playground for registration). Coaches are still needed – if you have already agreed to coach and/or can help one or more Saturdays during the season, please find Tom Flight near the Playground at 9:45am to discuss assignments and schedules. The *5K for the Food Pantry *(sponsored in part by Montauk Youth, Inc.) will be held this Sunday, September 15. The race starts from the Gazebo in downtown Montauk at 8:30am, registration opens at 7:30 – suggested donation is $20 per adult / $10 per child. All proceeds will go directly to the Montauk Food Pantry. Organizers will also be collecting non-perishable foods. Our Wednesday *Flag Football is now being offered to 3rd through 6th grades*.If you, a friend or a responsible High School student can help us with the program on Wednesdays directly after school, please let us know ASAP. Fliers for all are attached. Thank you all for your support as we begin this school year. Montauk Youth, Inc. is an all volunteer organization that relies on the help of parents and friends to coach, teach and organize. Let us know if you’d like to help (other upcoming Montauk Youth programs and events: Field Day, October 6 / Street Painting at Montauk’s Fall Festival, October 13 / Scarecrow Days, October 11 through November 2). 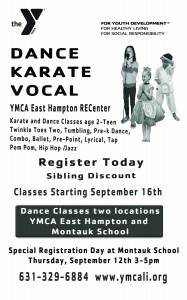 See below info on Fall programs from Mike Ritsi at Sportime Amagansett. In addition, Montauk Youth will be opening its Wednesday Flag Football program to the 3rd grade. We will send flyers home with the 3rd grade students. Hello all, hope everyone had a great summer. Now that we are back to school, I’m sure the kids are busy with different afterschool activities. 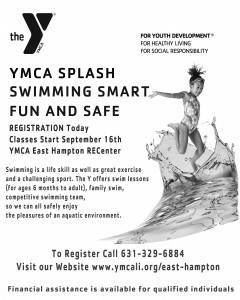 I am writing to inform everyone about our fall programs at Sportime! Our clinics include; certified/experienced coaches, fun classes that teach fundamentals and basic skills, and an amazing gymnasium. We also have a “Play Date” class for children 9 months-4 years old. It takes place on Monday and Thursday’s from 10am-12pm in our multi-sport arena. Playdate consists of fun, safe, foam equiptment. A great opportunity for parents and children to meet and and interact! We also have great sports Birthday Parties at Sportime! Please feel free to contact me with any questions/concerns. I look forward to working with you and your children in the near future! We’re back to school and there’s tons going on. Check out upcoming Montauk Youth, Inc. and other programs below (we’ll have them up on our Youth Calendar soon at www.montaukyouth.org). As a reminder, Montauk Youth is an all-volunteer organization and we need your help to keep our programs going. Please let us know how you can help with any of our upcoming events and programs. We’ll be having a planning meeting soon – I’ll let you know. We’re willing to send out information on upcoming youth events and programs. Just send us the info. Please help spread the word of this email service. We are able to reach out to a lot of Montauk’s families, but know we are missing some. Thanks so much and enjoy this beautiful day! Maureen President, Montauk Youth, Inc.
Montauk Youth, Inc. Programs and Events: – *Flag Football for 4th through 6th grades *- Wednesdays directly after school at the Montauk School starting this Wednesday, September 11. $25 for the 8-week program – must purchase Montauk Youth reversible jersey separately (will be available at Pier Group downtown – near Naturally Good Cafe). No need to purchase a new reversible if you have one already. Flyer attached. Younger grades could be offered if we find parents willing to coach – let me know if you are interested. – *Spirit Squad for 2nd through 4th grades* – Wednesdays directly after school at the Montauk School starting this Wednesday, September 11. $25 for the 8-week program – must purchase Montauk Youth reversible jersey separately (will be available at Pier Group downtown – near Naturally Good Cafe). No need to purchase a new reversible if you have one already. Flyer attached. – *Soccer for Pre-K 4 through 6th grades* – Saturday mornings at the Montauk School. $25 for the 8-week program – must purchase Montauk Youth reversible jersey separately (will be available at Pier Group downtown – near Naturally Good Cafe). No need to purchase a new reversible if you have one already. Flyer attached. – *5k for the Montauk Food Pantry* – Sunday, September 15 – flyer attached – *Field Day* – Sunday, October 6 at Third House – Save the Date. – *Scarecrow Days* – Montauk will play host to your scarecrows for this Third Annual event. Details to follow, but start getting your ideas together!!! – *Street Painting at Montauk’s Fall Festival *- Sunday, October 13. Mark your calendars for this Second Annual event – it’s your chance to help decorate Main Street and get your art out there for all to see!